In Deadly Ties (first in the Waterside Kennels mystery series), part of the plot revolves around treasure legends. 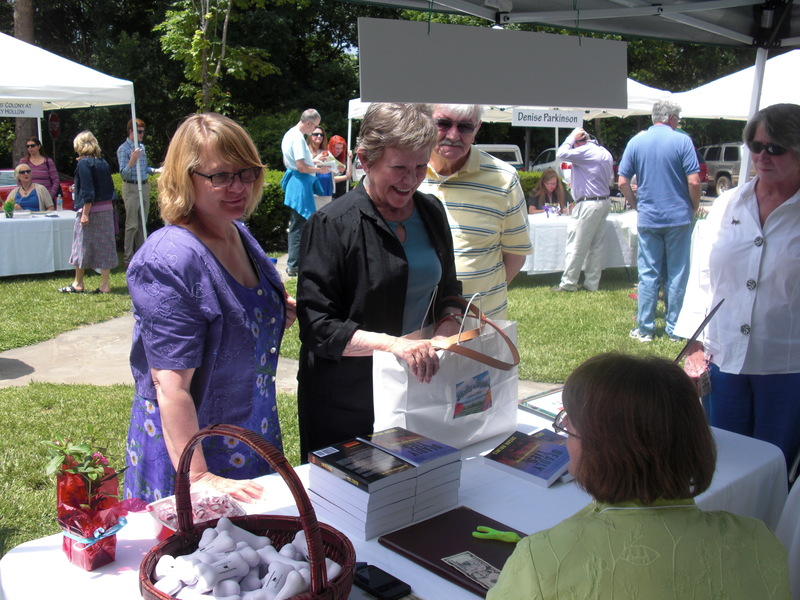 While that makes for great fiction, let me tell you about a real treasure of the Ozarks—the Books in Bloom Literary Festival. I was honored to be one of the featured authors at this year’s event, and it was a terrific experience! Great to see readers of all ages! Held in the gardens of the legendary Crescent Hotel in Eureka Springs, Arkansas, Books in Bloom is the brainchild of the Carroll and Madison Public Library Foundation to promote the value of books and reading. And boy, do they promote! 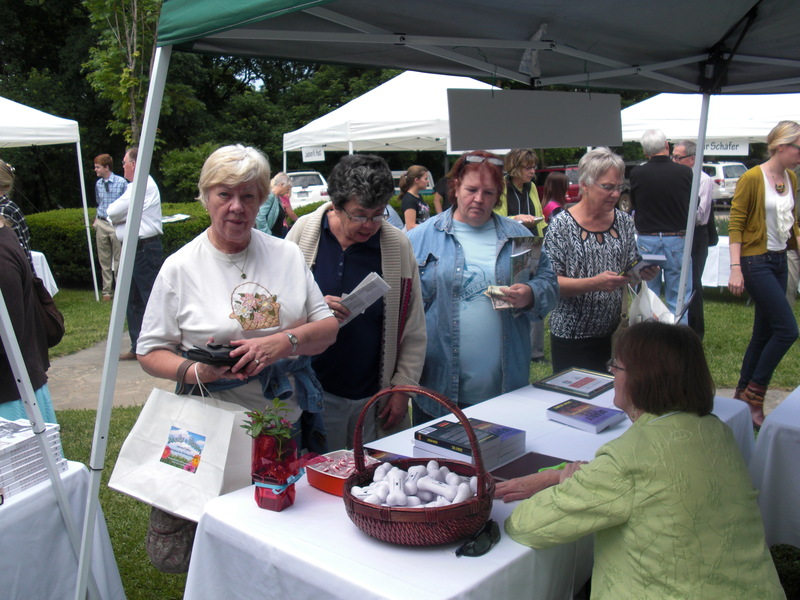 In the six weeks leading up to the festival, there were multiple feature articles and news stories about the festival and the participating authors. A special “thank you” must go to Jean Elderwind, co-chair of this year’s marvelous event. She was in steady contact in the months leading up to the festival, supplied all sorts of information, and was ready to answer any question. Jean coordinated media requests and introduced me to two great writers, who each published a feature article about me and my work. Jennifer Jackson of the Lovely County Citizen published an article on April 10th titled “Elementary, My Dear Dachshund – Trip to Eureka Springs sets author on the write track.” C.D. 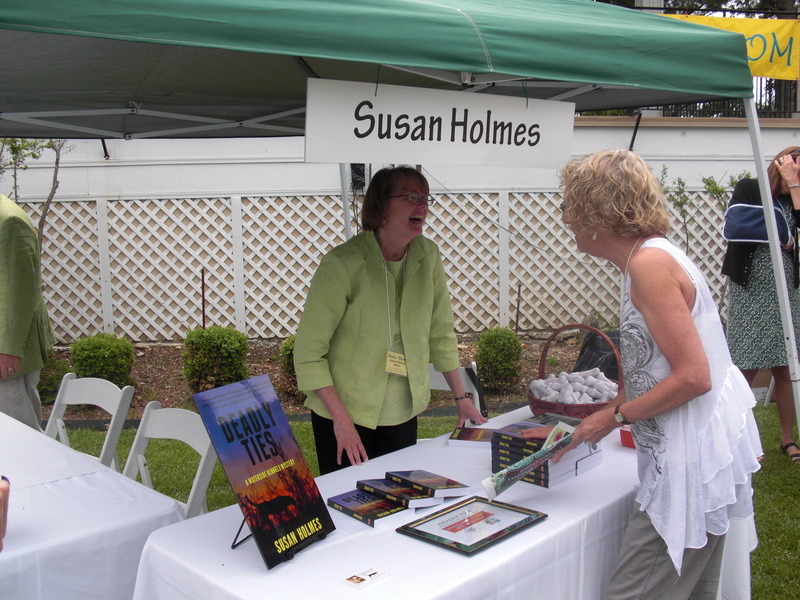 White of the Eureka Springs Independent ran an article on May 14th titled “Woof woof wonderful: Author Susan Holmes has marked her niche.” Thanks to their superb publicity, readers and fans came out in droves to get their own signed copies of Deadly Ties. The weather was perfect, the gardens beautiful, and the Foundation Board and volunteers treated the authors like royalty. From the lovely reception the evening before the Festival, to the lavish brunch the morning of the event, to lunch delivered right to us, we were exceptionally well cared for. Volunteers erected shade canopies and set up chairs and tables (complete with white tablecloths and beautiful flowers). We unloaded just steps from my booth, with more volunteers available to help with anything needed. Organizers gave authors the option to bring and sell their own books or to have the bookseller bring books for them. I chose to bring plenty of my own (just in case!). And I’m very glad I did, because the bookseller would probably have sold out long before I ran out of customers clamoring for a signed copy of their own! I signed books all afternoon for readers across the age spectrum. One of my favorite conversations was with a young reader who told me she loved playing with her dogs and reading mysteries with her grandmother. My kind of fan! I enjoyed the chance to meet librarians from the Carroll and Madison library system, and was thrilled to know the St. Paul (AR) Public Library’s book club will feature Deadly Ties this summer, and I’m invited as a speaker! 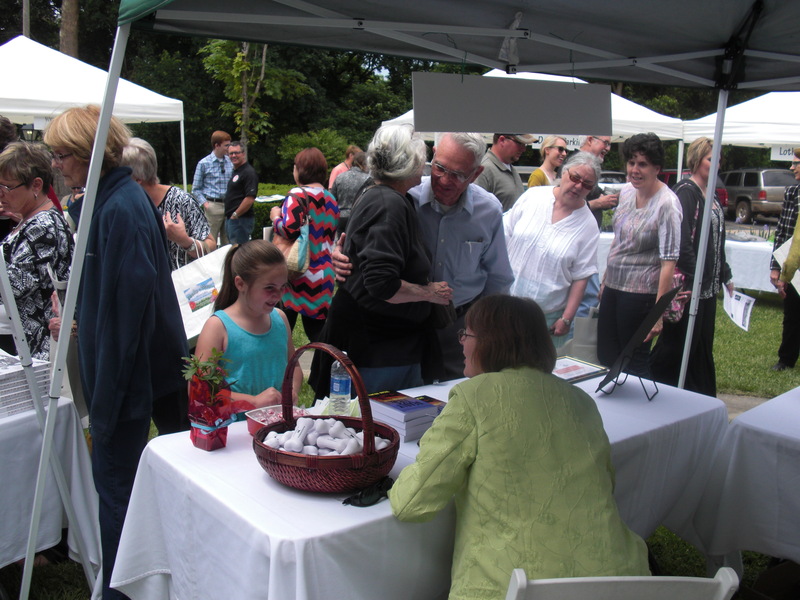 I was delighted to visit with fans and sign books throughout the afternoon. I’d thought the crowd would thin out by the time I was at the podium in the Reader’s Tent since I was the final speaker of the day. Instead, I was amazed to find every seat taken and a small crowd standing at the back! The audience was a writer’s dream—terrific listeners and clearly eager to hear about the book and the series. I gave them a “sneak preview” of the next book in the series to thank them for staying until the end. I finished to a huge round of applause—a perfect ending to a perfect day! So great to see old friends and meet new fans! Thanks to all the readers who turned out! You can follow the Books in Bloom Literary Festival on Facebook and online. And mark your calendars for the 2015 festival; it’s sure to be another winner! This entry was posted in Uncategorized and tagged Books in Bloom Literary Festival, Crescent Hotel & Spa, Eureka Springs. Bookmark the permalink. Wow, Susan. What a perfect day to be a writer. The festival sound wonderful. So glad it all went so well. Susan, it was a fabulous experience! If you ever get the chance to participate in Books in Bloom, go for it!